Living in San Diego for some time, I have a great deal of affection for fish tacos. I was missing a little taste of the place we love so much. Being so far away from any ocean, we had to use frozen fish but do use fresh if you can. This would be great with halibut, salmon, or tilapia, just to name a few. 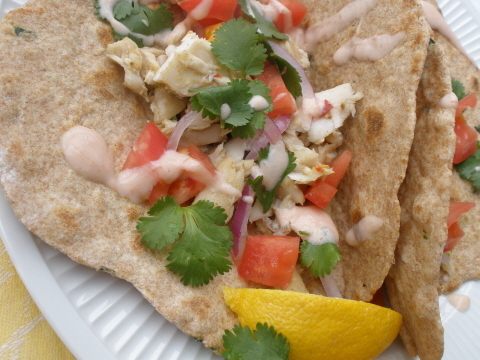 So here you have them, fish tacos, served on homemade Cilantro Whole-Wheat tortillas. For the tortillas I used half of this recipe , substituting the all-purpose flour with whole wheat and adding a small handful of chopped cilantro to the milk and oil before combining with the flour. Preheat oven to 400°. In mortar and pestle combine zest from half a lemon, juice from same half lemon, cilantro leaves, red pepper flakes, salt, oregano, cumin, and garlic. Mash ingredients together until evenly distributed. Place mahi fillets in baking dish and cover each with half of lemon juice, and herb mixture. Cook mahi in preheated oven until it is cooked through and flaky, about 15 minutes. Once removed from oven, flake with forks. Serve mahi in tortillas and load up on garnishes. I would like to suggest beans and rice for sides. Would a margarita count as a side dish? If so, I would like to suggest that too.